Installing the perimeter wall angle for a drop ceiling is probably the easiest part of a suspended ceiling installation. 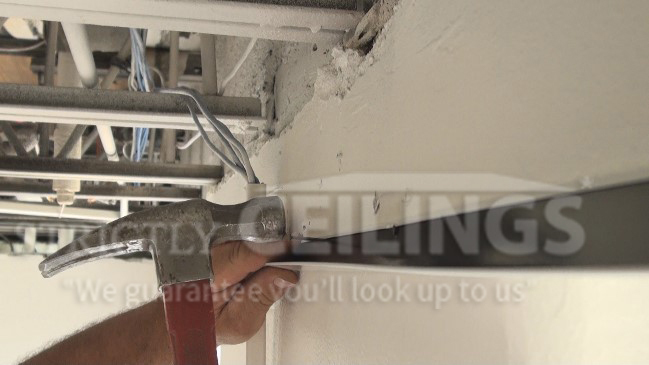 The most important aspect of this installation is to keep the wall angle level and tight up against the wall as it will determine the overall sharpness of the ceiling. 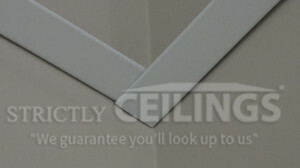 The wall angle for a drop ceiling is usually L-shaped and its size is approximately 1” x 1”. It’s very important that the angle be installed securely so that it can properly support the main runners and cross tees that sit on the perimeter of the ceiling. 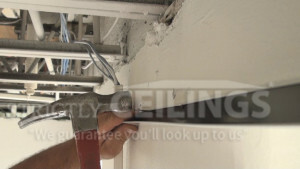 The wall angle is the first step in the drop ceiling grid installation process. As professionals we typically install the wall angle before installing the wires so that the wires don’t potentially stab us as we are moving around the perimeter of the room. However, you can choose to install the wires or the wall angle first, it’s your choice. First… determine the height of the ceiling. If you are installing in a basement you will want to have no less than 3” of clearance below the joist or 2” below the lowest obstruction. An obstruction could be ductwork, piping or an electrical component. The main runners and cross tees for a drop ceiling are approximately two inches in height so if you choose 3” below the joist, this will leave you with only one inch of clearance to install the tile. This is not very much and for someone with little experience it would be difficult to install the ceiling tile. Although 3” would be the minimum, if you could do 4” you would be much better off. The more clearance you allow, the easier it is to install the grid and tile. 6” of clearance in a basement is optimal. After verifying for obstructions be sure to factor in the depth of light fixtures when considering the height of the ceiling. Once you have determined the height add 1” to that height and place two marks on the wall about 18” away from each other. These marks will be the top of the wall angle. 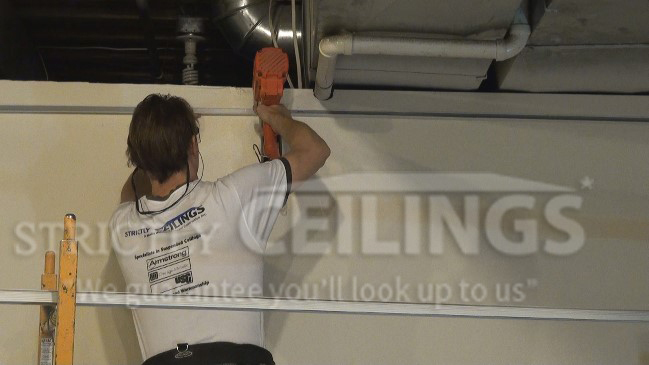 Don’t place the marks at the ceiling height because the wall may be painted and would then require touch up. 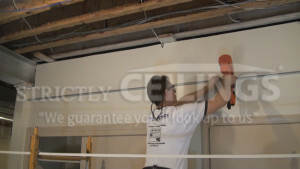 Determine whether the wall you are starting your installation on is longer or shorter than 12’. Most wall angle only come in 12’ lengths so if it’s shorter than 12’ you would need to measure and cut the piece to the proper length. Place the angle on the wall up to the marks you made and secure with 2 or 3 fasteners no more than 4” apart. Wall angle for drop ceilings can be fastened many different ways but what fastener to use is determined by what type of wall you are fastening to. We generally use a cordless staple gun, but not everyone will have access to one of these. If you have steel studs you’ll need screws or fence staples. If your walls are block you’ll need a either a 1” hardened nail which you will fasten into the mortar joint or you can use a small ¾”hardened nail which will penetrate right into the block. Once the wall angle is temporarily fastened you can install your Laser if you have one. Simply hang the laser on the wall angle and turn it on. 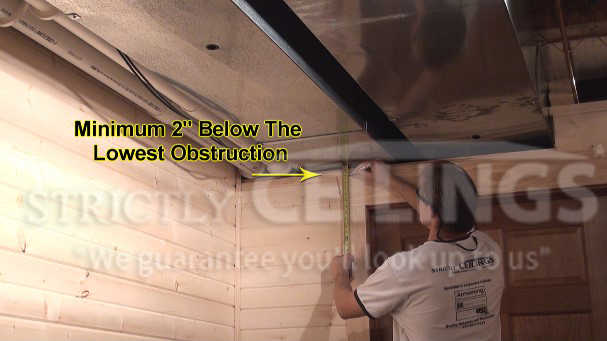 Make sure that the beam is running just below the ceiling height. If you don’t have a laser than you simple measure the ceiling height in every inside and outside corner, place your mark 1” above the height and snap a chalk line to the marks you made on the wall. When you don’t have a laser there are two ways of setting your ceiling height. You can measure off the floor; but just make sure that your floors are relatively level and flat. If your floors are not flat you can measure down off the ceiling joists or subflooring on the floor above you. After you have verified the height, follow the line you snapped or the laser line and secure the first length of wall angle by placing a fastener every 12 to 16”. If you’re using a staple gun you’ll want to space your fasteners about 6” apart. Once you have the first wall completed, if the adjacent wall you’re working on is an inside corner simply lay the wall angle on top of the existing piece you already installed. It should look something like the picture to the right. You could also miter this corner if you’d like. At some point along your install, you may encounter an outside corner. Here’s a fast and easy way to miter a 45-degree angle on an outside corner that will look great. Measure the wall to the corner and add 1 ¼” and cut the length of the wall angle. Place the angle on the wall and with a pencil, mark the wall angle at the corner. There should be 1 ¼” of the wall angle going past the corner. Cut only the top of the angle off on the mark, leaving an L shaped ending. Install the piece and secure it to the wall. Repeat the same steps on the other side of the wall and place the wall angle against the wall. Allow the angle pieces to overlap and with your tin snips, make a crease at the point where the angle meets. Lift up the loose angle and using a tin snips cut the secured piece on a 45-degree angle towards the point of the wall. Place the loose piece back on the wall and secure. This entry was posted in Ceiling and tagged ceiling installation, drop ceiling, garnelenterprise, Steel Framing, wall angle. 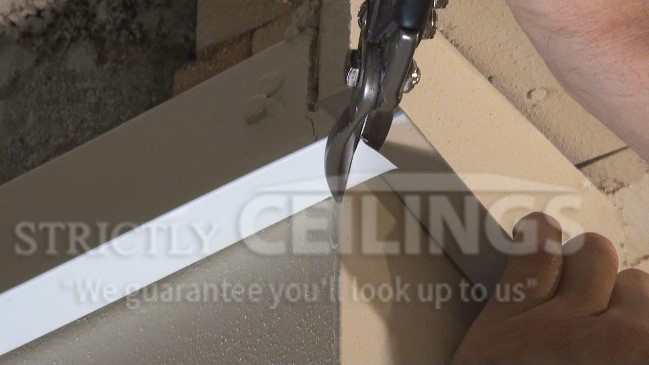 First and foremost would like to thank you in writing this blog with regards to the step by step guide in how to install a wall angle for drop ceilings. Reading the well thorough guide is quite helpful to those who are complete layman and don’t know how to do it in the first place, this blog that you’ve written is quite informative and is a great help. Cheers!